The Steering Committee of FELs of Europe (FoE) met in Hamburg on 19 and 20 of April 2017. 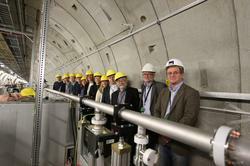 The first day the meeting was hosted by the European XFEL at the Schenefeld premises, the second day by DESY at FLASH. The new European XFEL Director General, Robert Feidenhans’l, welcomed the members of the Steering Committee and presented exciting news on the progress of XFEL, which expects to host the early user experiments in autumn this year. The Steering Committee members had the opportunity to visit the XFEL experimental hall and user laboratories, getting an impressive overview of the different instruments just a few days before the first lasing, and the new FLASH-2 experimental hall. Several strategic aspects of the FoE collaboration have been addressed during the meeting, chaired by Rafael Abela. The latest developments of the LEAPS (League of European Accelerator-based Photon Sources) initiative were presented by Caroline Hahn and the possible interactions between FoE and LEAPS were discussed, as well as different possible schemes for FELs of Europe to become a legal entity. The plans for the POLFEL Test Facility and the progress of CalipsoPlus and EUCALL were presented. The Steering Committee was also informed on the status of the organisation of the Photon Diagnostics workshop (SLAC, May 2017) and of the Science@FELs conference (Stockholm, June 2018). Since the term of R. Abela as a chairman of the Steering Committee ends by June 2017, a new management board has been elected, with M. Svandrlik as chairman and B. Redlich and S. Molodtsov as deputies.